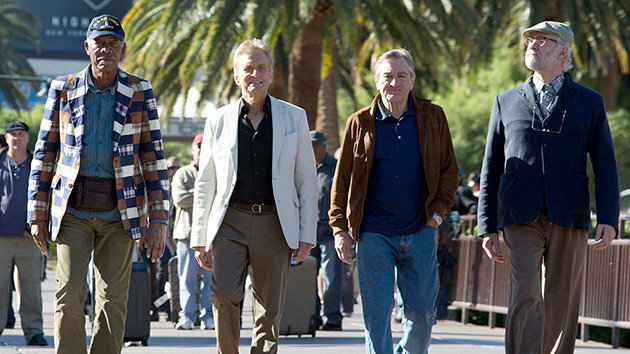 Having big names in one movie can sometimes point to disaster, so I entered Last Vegas with a little trepidation. I needn’t have because what you get a charming little comedy held together by the sheer charisma of the talented cast that has surprisingly a big heart at the centre of it. Plus the chance to see five veterans proving they still have it. Billy, Paddy, Archie and Sam were best friends who formed a gang called the Flatbush Five. The fifth member, a girl called Sophia, who eventually married Paddy. 58 years later and Billy is about to get married to a girl half his age in Las Vegas. Calling upon his old gang, they decide to throw him a bachelor weekend before he finally gets hitch. Tensions rise between Billy and Paddy, as Billy didn’t attend the funeral of Paddy’s beloved wife. Once there, the gang, all in the autumn days of their lives, decide to live it up and find the youthfulness within them, as well as love in the form of a sassy lounge singer called Diana, who could pull Billy and Paddy apart again. What you have to remember when going in to see this, it’s not the greatest comedy ever made. It won’t stay in the memory longer than a few hours and it definitely won’t set the movie world alight but what you will get is a thoroughly entertaining couple of hours, even if some of the gags are as old as the cast. Seasoned director Jon Turteltaub has made a career out of disposable films that aren’t looking for any awards and so he knows what to do, point the camera at his actors and let them do the work. Scriptwriter Don Fogelman (who wrote Crazy, Stupid, Love and Tangled) throws a series of sometimes cringe-worthy gags with a plot that could easily be described as The Hangover for Pensioners, except the difference between the Todd Phillips’ comedies and this, is that underneath the jokes about getting old, there beats a charming heart. So we get subplots about friendship, lost youth and even at their age, love can still exist. There are a few moments that sit uncomfortably. The four men judging a bikini contest plays out more like a dirty old man’s convention and the slightly forced relationship between Sam and a young girl could have been awful if it wasn’t for the fact that Fogelman puts the brakes on before it goes too far. Those moments aside, the film’s real strength lies in the cast. Michael Douglas, who proved his comedy hand last year in the excellent Behind The Candelabra, is playing it more as himself, while Robert De Niro gets to let his hair down a little as the grumpy Paddy. Morgan Freeman is always a joy to watch and it’s good to see him doing comedy. The real treats come in the form of two actors who we see very little of nowadays and they deserve much more attention: Kevin Kline and Mary Steenbergen. Kline, as Sam, delivers every gag with the same energy and punch that made him an Oscar winner in A Fish Called Wanda. Just a raised eyebrow is enough to score big on the laughter scale. While Steenbergen is as charming and infectious as she was all those years back when she made her debut in the underrated Melvin And Howard. After this, let’s hope we see much more of these two delightful actors. If you are looking for something to just sit back let roll over, then this does the trick very nicely. In these dark, miserable days when the weather is hardly sunny, it’s good to find a little ray of light that will make you smile. You might not have big belly laughs but chuckling throughout is just as good, if not, better. It was just a fun, light-weight comedy that does what it intended to do…make you smile.